Modern life is full of spills. Between children, animals, and random mishaps, a lot of water, drinks, and even cleaning supplies can be accidentally spilled on floors. When this occurs, it is important that you know your home is covered. 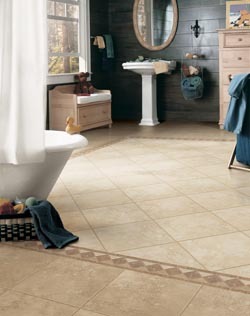 Turn to our flooring showroom for the waterproof flooring in Yuma, AZ, you need to ensure that water damage is avoided. We have a wide variety of styles to choose from that are manufactured by some of the leading brands in the industry, including Downs H2O and Tigressa H2O. With our help, you can keep your foundation and flooring safe from the harm of water damage. While a single small spill might not seem like much, it can cause a lot of damage if it’s not cleaned up right away. The spilled fluid could sink down into the subfloor and cause mold to grow or weaken the foundation over time. Over the years, the combined spills of a household can cause serious damage to your home. When you take into account the possibility of major incidents such as burst pipes and overflowing toilets, it is no wonder that so many homeowners opt for waterproof luxury vinyl flooring or waterproof carpet. With waterproof flooring in your home, you can rest easy knowing that water is a mere inconvenience and not a major threat. You may be worried that choosing waterproof floors will limit your options in terms of design. However, by coming to us for your waterproofing needs, you won’t have to. We have a huge variety of gorgeous flooring from the best brands in the industry. Tigressa and Downs both have H2O lines of floors, and each company offers a range of options. These companies are both well-known for providing quality products made from the finest materials that the industry has to offer. We are the name to trust for access to their lines of waterproof vinyl flooring, as well as waterproof carpet. Regardless of your personal sense of style, we have the design choices to suit your home’s needs. Every home is different, and therefore one must tailor the look of their floors to suit the style of the space. We are more than experienced enough to help you come to a decision on which style of waterproof floors will work best for you, and LVT is excellent for mimicking a variety of different flooring styles that can suit any look. Stop by today and go over your options for matching your style. Many people don’t realize that carpet can be made waterproof. Given how difficult it can be to get all of the moisture out of traditional carpet after a spill, it is among the most requested types of waterproof flooring. With our help, you can get the best of both worlds; the cozy, warm feeling that carpet brings to any home and the safety of waterproof floors. Turn to us for the solutions you need to waterproof your home’s floors. Contact us today to go over your options for getting premium waterproof floors. We proudly serve Yuma, San Luis, Somerton, Wellton, and Dateland, Arizona, and the surrounding areas.